Unravel draws its inspiration from spiral growth forms. These naturally occurring patterns help shape objects as diverse as hurricanes and nautilus shells. 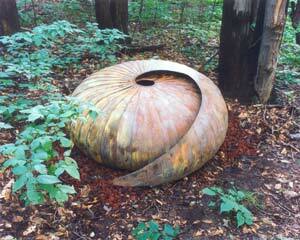 The segments of the this bronze sculpture expand from one another like the shell of an insect or a pine cone. Sandra Osip donated Unravel to MLAP in memory of Mr. Phillip Fike, her professor at Wayne State University. Osip said, "Mr. Fike was not only a professor of metalsmithing, but also a mentor and inspiration for many individuals…"